Xiaomi has equipped the Redmi Note 5A with a regular 16:9 display, with a 5.5" diagonal and 720p resolution. While the HD resolution is a bit of a stretch at that size, there is no visible pixelization and the image is reasonably sharp at 267ppi. Xiaomi promises a 1000:1 contrast and a maximum brightness of 450 nits. In our tests it did even better reaching a maximum brightness north of 530 nits and an excellent contrast at 1670:1. The blacks are quite good too. The sunlight legibility is barely average but it's reasonable to expect such a score in the price bracket. If you don't mind some washed-out colors and loss of contrast, the screen should remain readable when you're out and about on a bright sunny day. The colors themselves are not that accurate by default with an average deltaE of 6.9 and a maximum of 14 at point white. The whites and grays have a bluish tint, while most of the other hues we tested were more vibrant than usual. If you want slightly more accurate colors, you could set the color mode to standard or warm in the settings. The Xiaomi Redmi Note 5A is powered by a 3,080mAh battery - far from impressive compared to the 4,000mAh units that used to power the 4th generation Redmi Notes. The Snapdragon 435 is not the most energy-efficient chipset around either, built on the old 28nm process. The Redmi Note 5A scored an adequate endurance rating still of 74 hours. Not too bad for a chipset that's not exactly latest issue. It did well in the screen-on and call tests, while the standby consumption turned out about average. The number is far from the 100+ hours of other Redmi Notes but by no means an embarrassment in this price bracket. 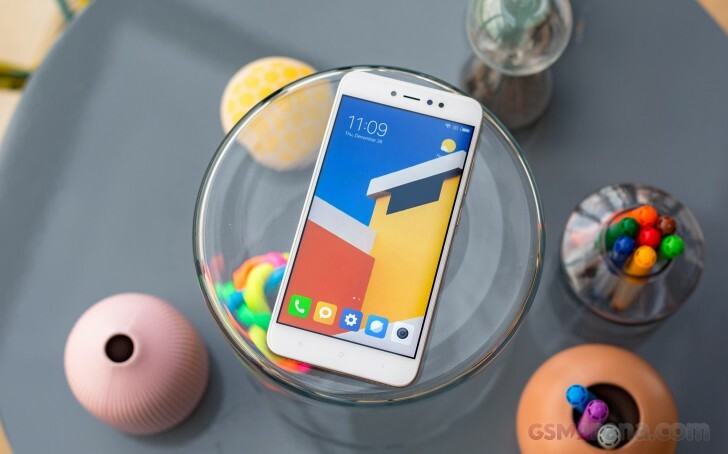 Our endurance rating denotes how long a single battery charge will last you if you use the Xiaomi Redmi Note 5A for an hour each of telephony, web browsing, and video playback daily. We've established this usage pattern so our battery results are comparable across devices in the most common day-to-day tasks. The battery testing procedure is described in detail in case you're interested in the nitty-gritties. You can also check out our complete battery test table, where you can see how all of the smartphones we've tested will compare under your own typical use. The speaker on the Xiaomi Redmi Note 5A scored a Very Good mark in our loudness test. Unfortunately, the sound is rather squeaky and shallow, and subjectively it sounds a lot quieter than the high-pitch notes registered by our tool. The Xiaomi Redmi Note 5A impressed with its loudness in both parts of our audio quality test. It was among the loudest phones out there both with an active external amplifier and with headphones, but its output wasn’t particularly accurate. Frequency response was poor with no headphones, while the other readings were rather good. Plugging in our standard set took care of that issue, but introduced plenty of stereo crosstalk and worsened the signal-to-noise ratio. We’d call the output acceptable, but it’s not one audiophiles will rave about.